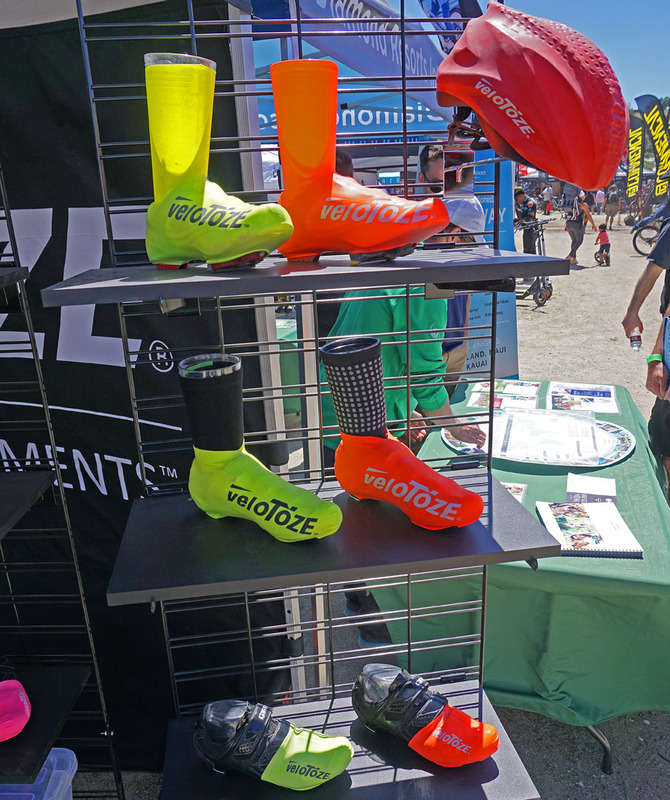 The 2016 Sea Otter Classic at Monterey’s Laguna Seca Raceway threatened rain early and was a little cooler than past years, but both the sun and many of the industry’s top manufacturers made it out in support of big crowds here for both the racing and a look at some of the latest gear from Praxis Cycling, SRAM, Park Tool, Nuun, Velotoze and Velofix. 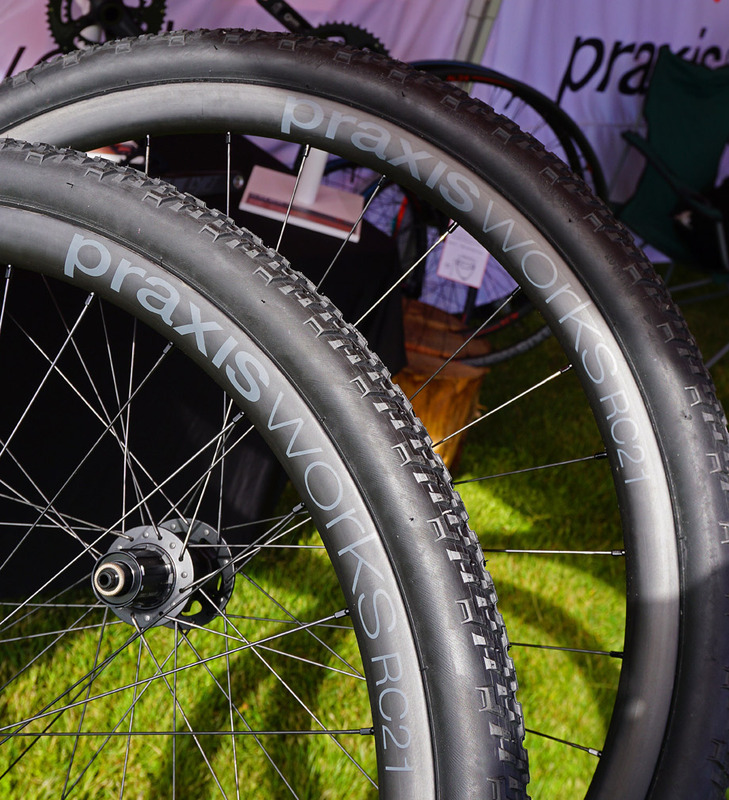 Praxis Works live very close to Laguna Seca - located just across the Monterey Bay in Santa Cruz and could have practically rolled their new wheel sets to Sea Otter. A lot of brands would call these the RC27’s taking the measurement from the outside of the sidewall, but that’s misleading relative to functional tire holding... 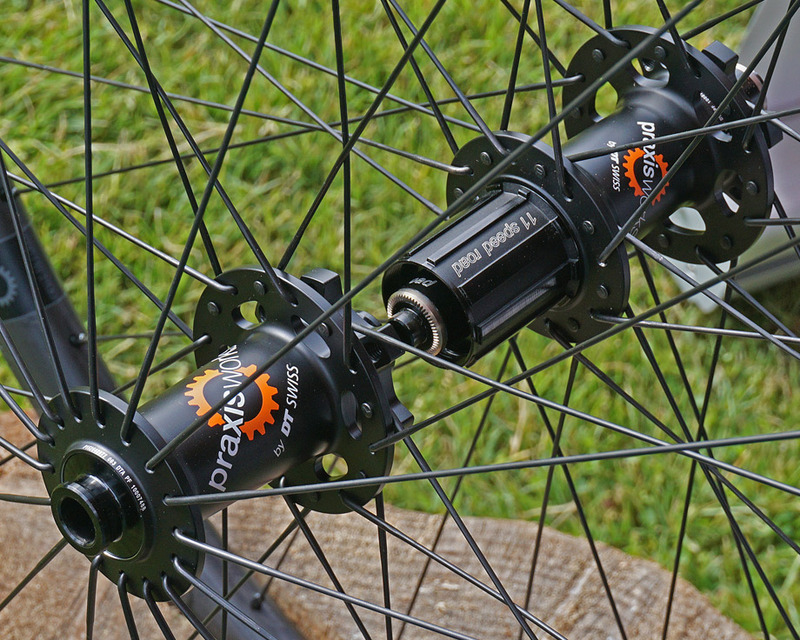 The RC21 has a 21mm internal sidewall (hookless profile) width for the 32 hole rim, which is plenty wide. These are a robust set of hoops with a 30mm depth to go with their ample width. 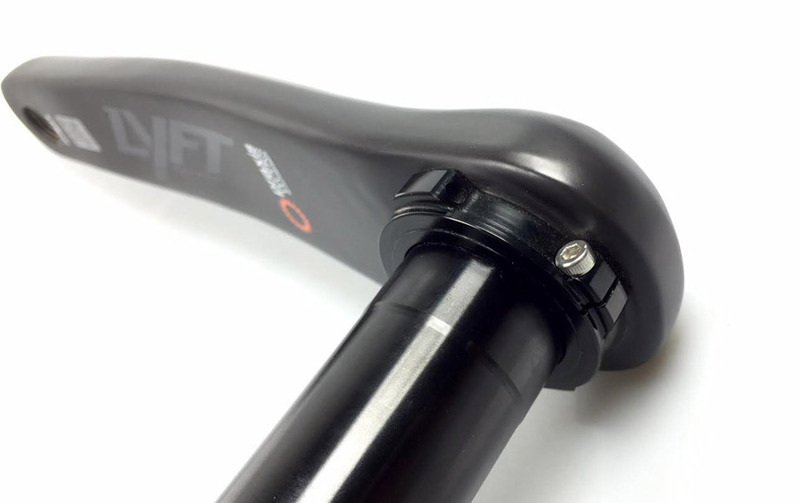 They’re at home holding chunky knobs and make an excellent seat for giving today's chubby 28-32+ section tires (because 25's are not even a half measure toward oversizing anymore) a nice mounted profile. 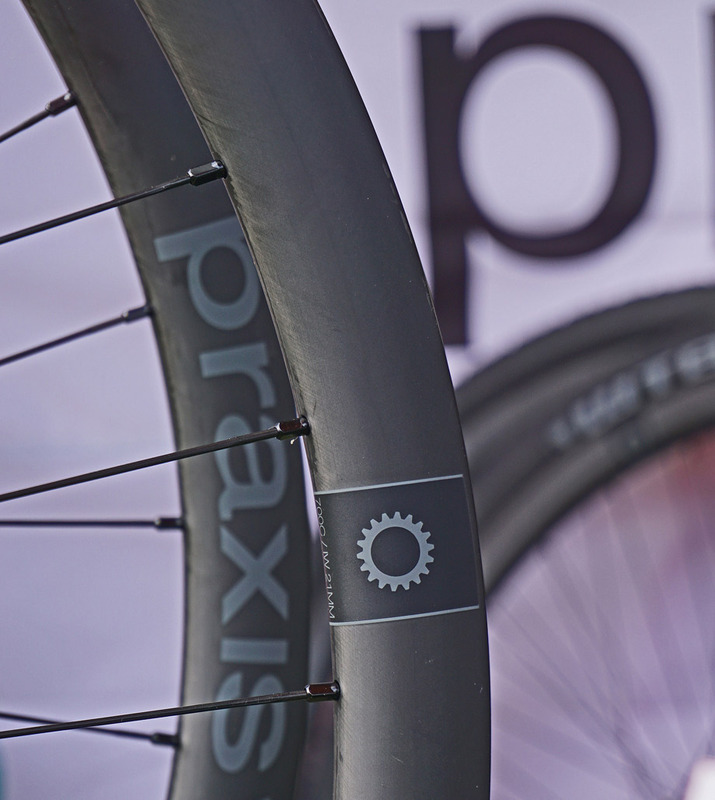 The internals for both front and rear are DT Swiss 350’s but Praxis designed a custom hub shell that features a beefed up flange design to handle more stress. 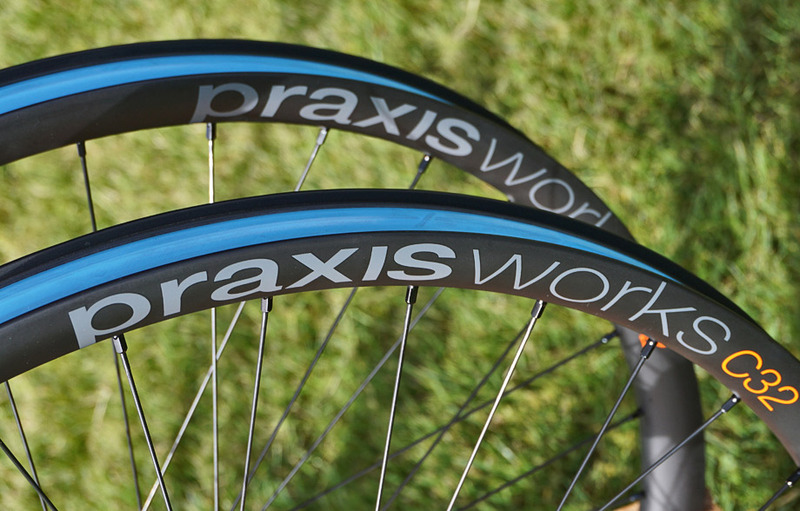 Similar to the thinking in calling out their internal side wall width, Praxis are also up front on weight, as the claim of 1570 grams actually includes both the rim tape and free hub. Something that some other companies leave out. 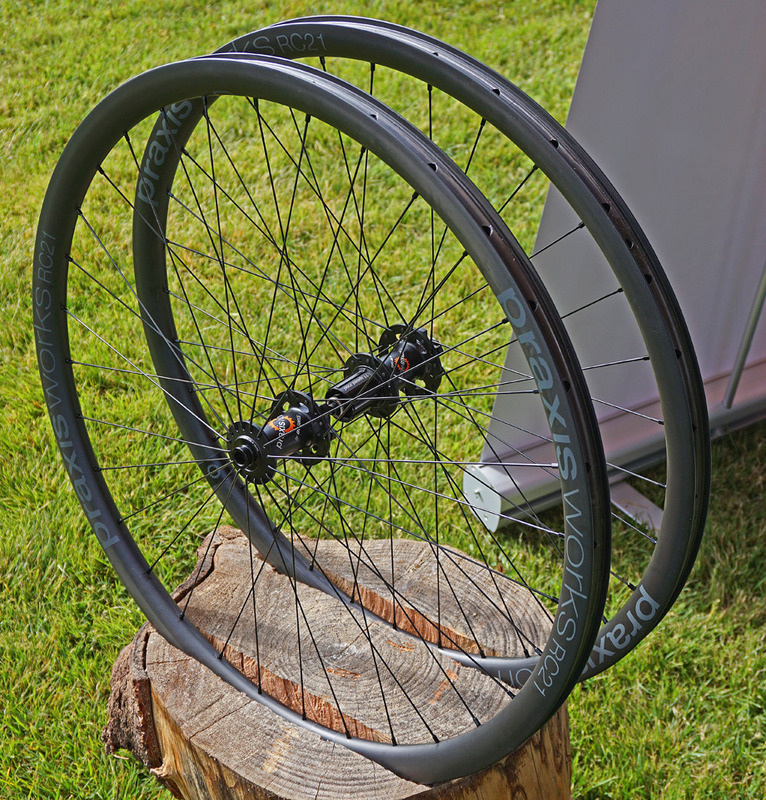 And the 1570 gram weight is for a relatively robust set of rims and 32 spokes as well as a hub set that serves double duty as the choice for their C32 All mountain wheels. These sets will come with the option for Thru axle and QR and the hubs are also XD drive compatible and roll on Enduro bearings and take a 6 bolt disc mount. 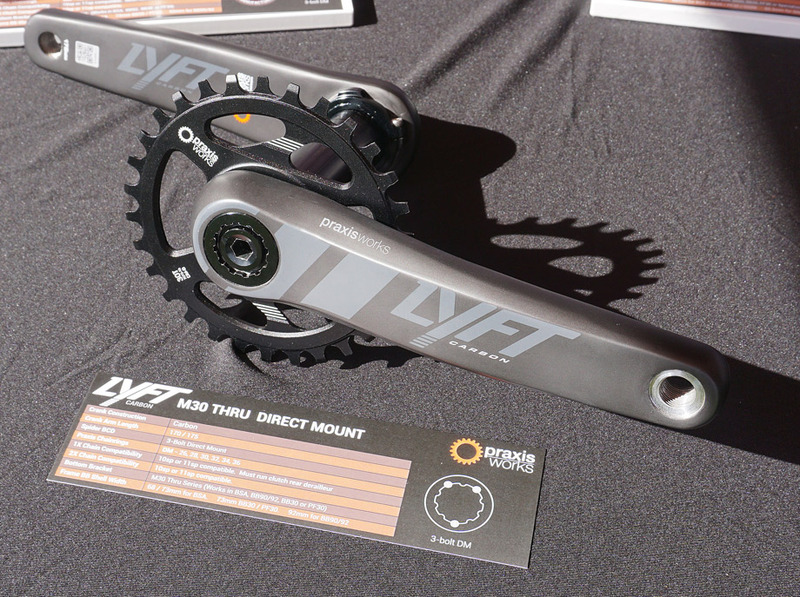 Praxis also revealed their Lyft Carbon Crank. While this is a mountain bike set, I’m hoping it speaks well to what they’ll introduce for the road. 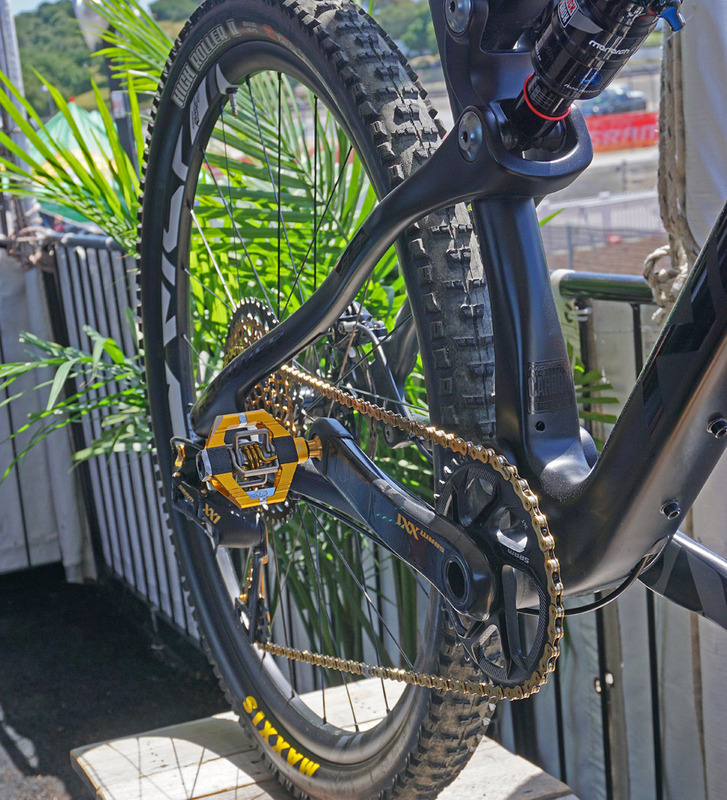 This is among the lightest set ups on the mountain side at 454 grams with a 30t direct mount ring. Meaning Praxis continues to push development on cranks in general. 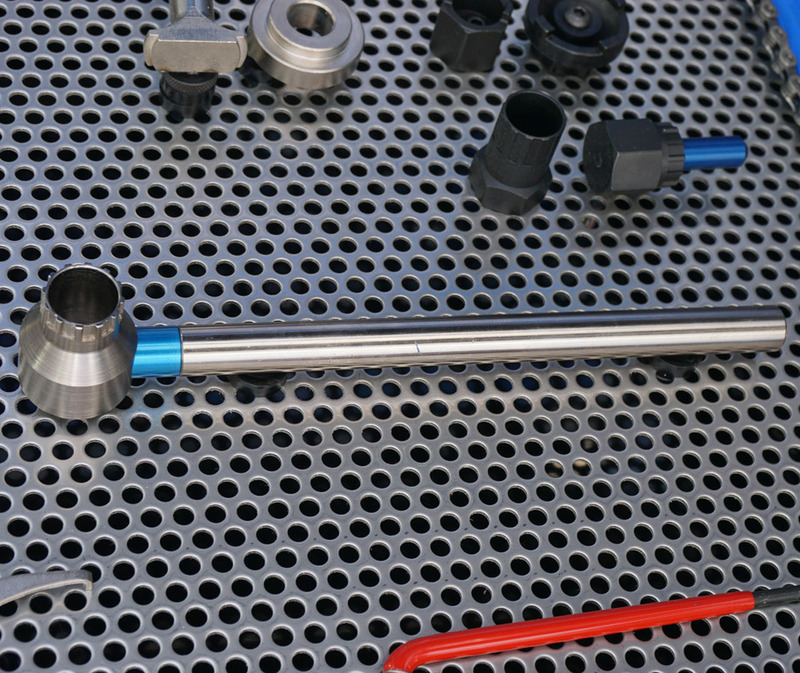 They also feature what should be the new benchmark for all cranks that use a tension adjustment. 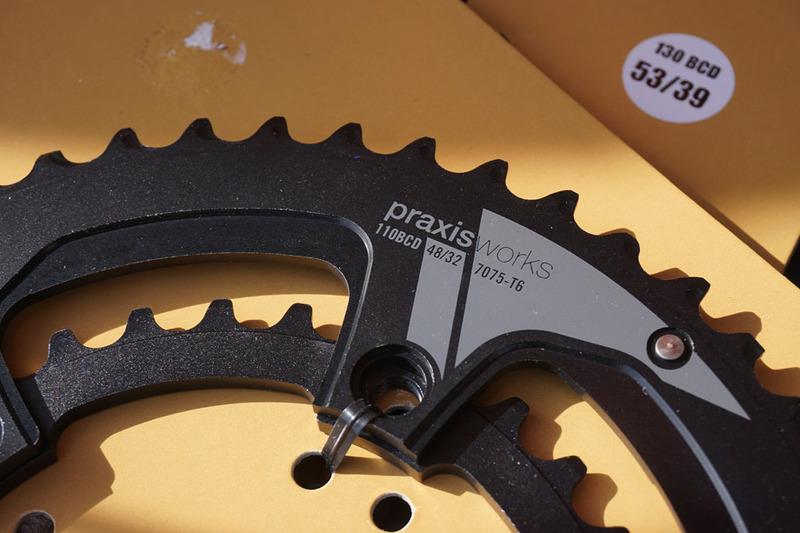 And Praxis has also pushed development on what are widely considered the best aftermarket chain rings available. The new cogs are now compatible with standard 5 arm spiders as well as 4-arm (with one hidden bolt) formats. They do this by putting the ramping in the right spot as well as allowing the catch pin to be relocated on the crank to match the different formats. And they’re making these in sizing down to a very compact 32. They have to machine a step to allow for clearance, but this allows you to run a very low small ring on a 110. These little details not only allow people a greater range of options, but they also allow shops to stock one type of high quality precision rings that will suite a couple of formats. The wheels and cranks should be available June/July and the rings should be ready shortly as well. 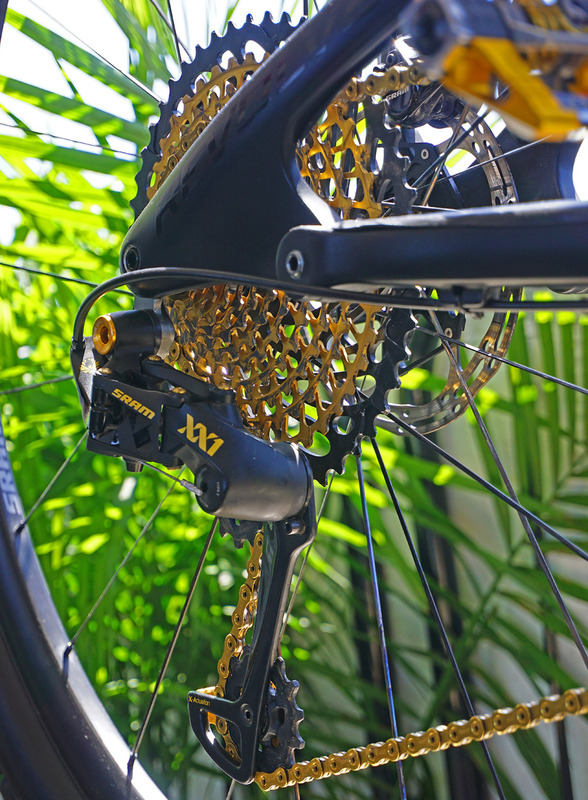 SRAM were also rolling out something that, like Praxis Carbon Mountain cranks, were not road focused, but will surprise nobody when it finds its way onto the road shortly. 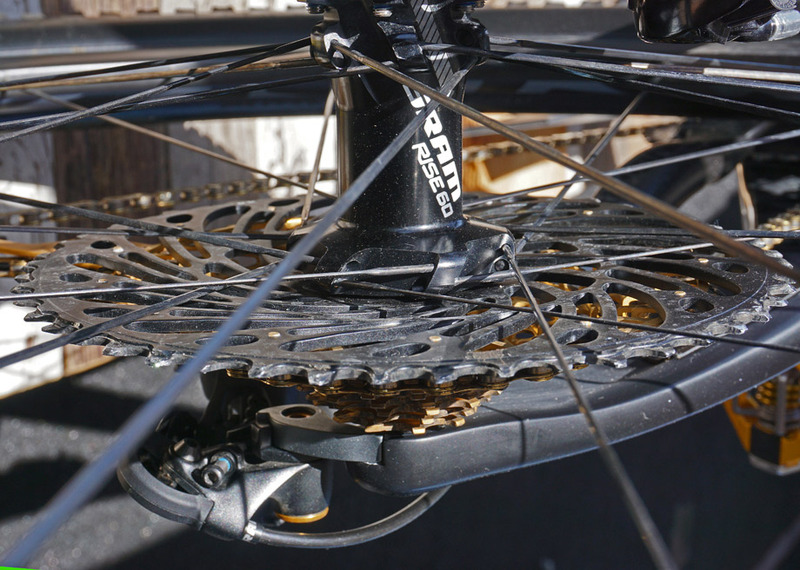 The implications are easy to understand… This is a well refined shifting set up that, when paired with a proper front ring, will further expand the use of 1x drive regardless of the surface you’re rolling over. 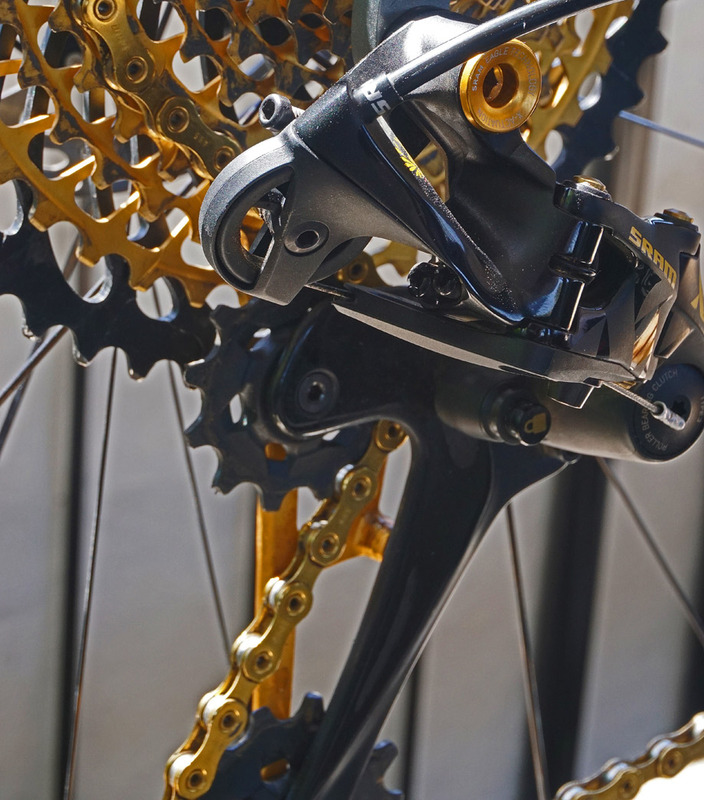 The cassette is an absolute monster at 10 – 50… And in order for SRAM to make this work, the cassette actually has some dish to it. The spacing between the 12 speeds takes up only a little extra room, but there’s no getting that done without some scoop shape. There’s also a pretty substantial amount of machining to allow for chain pick up. 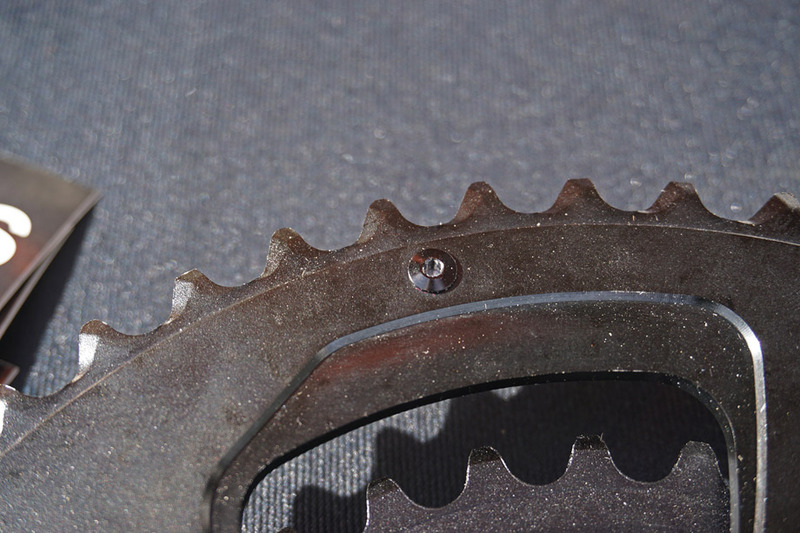 You might think that makes for a lot of noise and mechanical grunt work and grinding relative to the normal cassette shifting, but having seen the set up working, there’s no real difference felt in gear actuation versus their “old” 42 tooth ring (which went from outrageously large to merely average looking inside a year). In fact, this set up shifts (and sounds) comparable to a lot of much more normal looking ratios, if not maybe slightly more quiet. 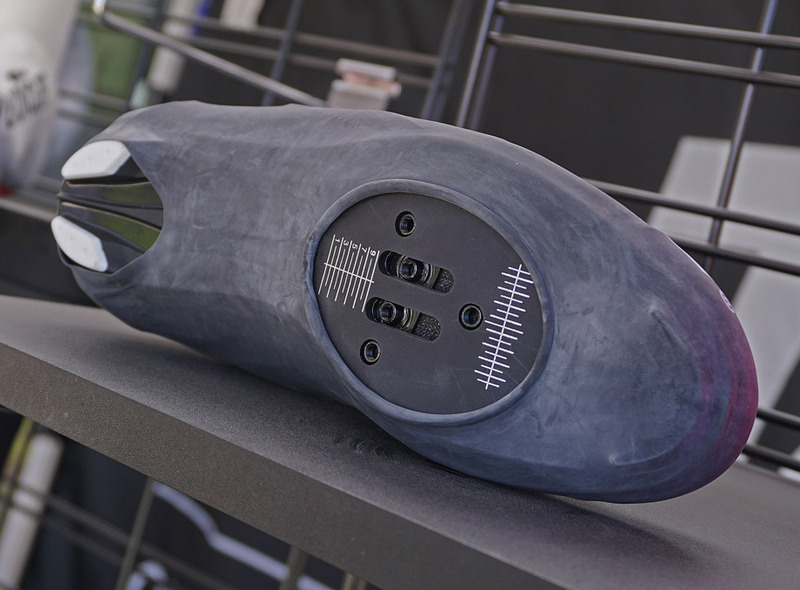 The sound (or lack of) and actuation is absolutely counter to what you would think at first glance, but makes sense when you get into the details. The pulley wheels are very large, giving more engagement and spreading the wrap over a larger surface. And there is also the pulley wheel smoothing out the cable bend and reducing the pull effort. What’s tough to show but is also critical is the much more refined and heavily reworked chain. 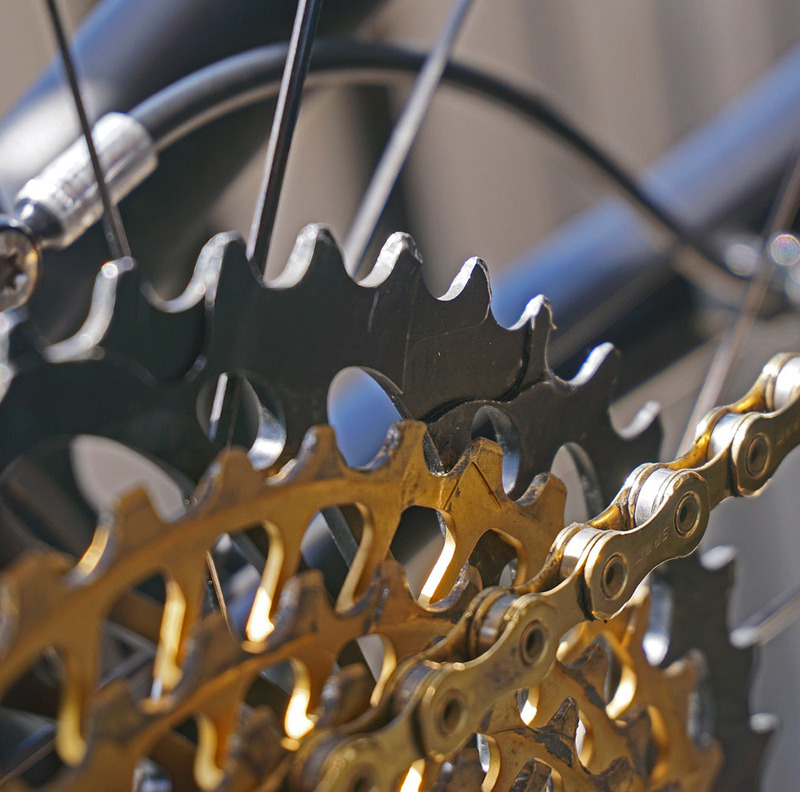 Think of all the pieces on a chain and you have a massive amount of friction, movement and in many cases, opportunity for improvement. The plates for the new chain are flatter and thinner and the edges have all been smoothed. 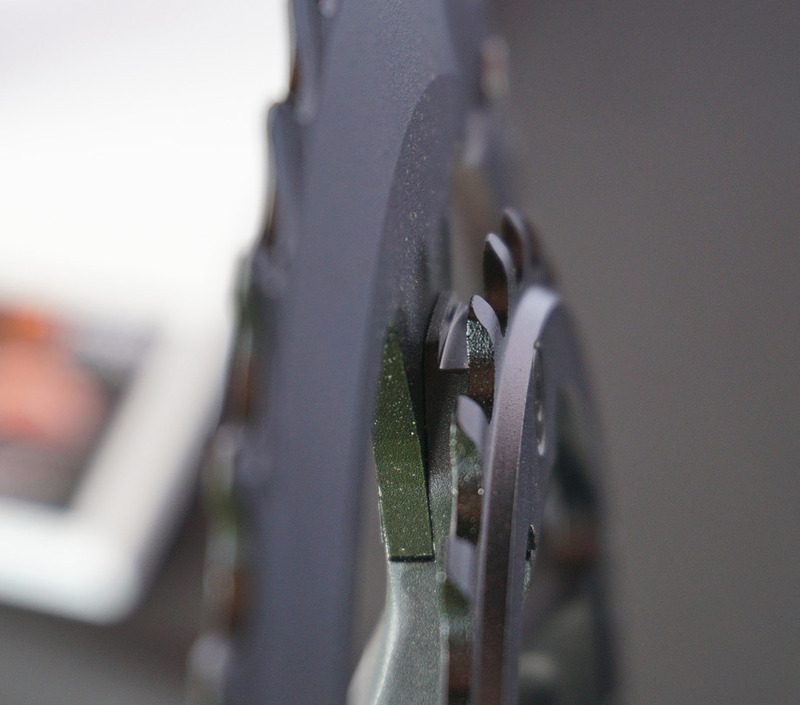 This all makes for a chain that moves better, has reduced wear and friction and also happens to be thin enough to work for a 12 speed set up. 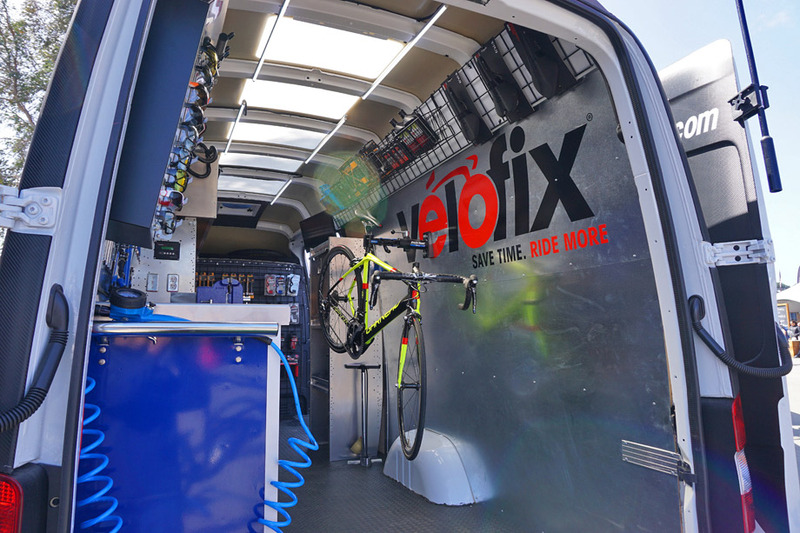 While all of this is, as we look at it today, a mountain set up, I can tell you that I would love to run this on a flat bar road commuter bike (and will) and that this tech push will translate to development for road groups. I’m a big fan of anything that pushes product further along and I don’t care where it comes from. These will not be cheap and they’ll be around shops shortly, I’m wondering which frame to turn into that flat bar commuter bike as you’re reading this. 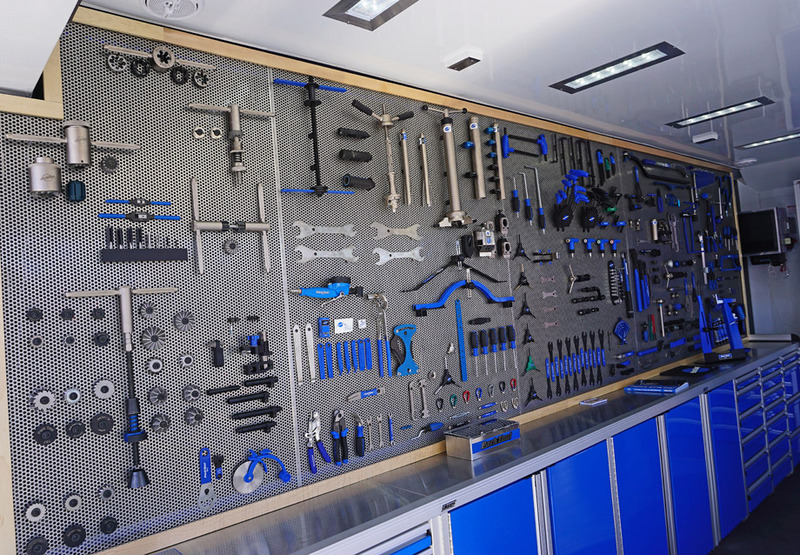 They not only displayed but had work stations around the grounds that featured a nice selection of tools for the huge swarm of riders on hand for the week. These are well made, shop quality drivers that look and feel the part, with nice sized grips that make handling and use a bit easier. They’re assembled and calibrated right in Minnesota and are all metal internals. They come in 4, 5 and 6 Nm presets as well as an adjustable version that will let you dial up 4, 4.5, 5, 5.5 and 6 Nm. Each has 1.4 inch bits in 3,4,5 and T25 that store in the handle. 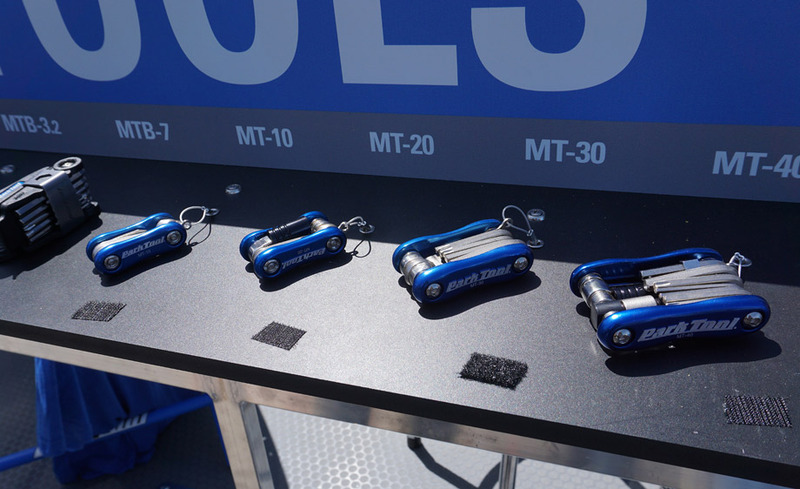 Park also had on display their new Multi tool sets that are built to outlast both your bike and very likely you yourself. 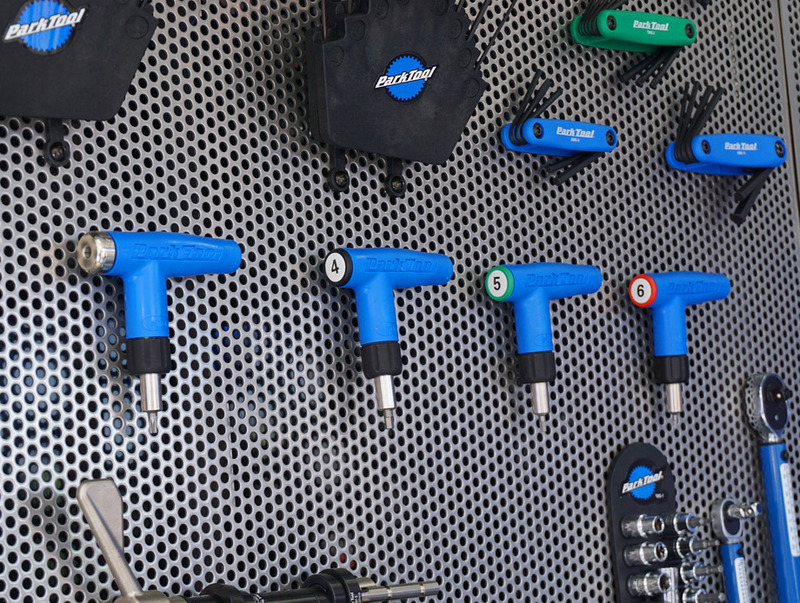 The MT-7, 10, 20, 30 and 40 have forged aluminum side plates, hardened and plated tools and range from the minimalist MT-7 to the fairly well stocked MT-40 with a fleet of hex sets as well as things like a chain tool and C02 adapter. In the case you switch cassette (SRAM/Shim) ratios with any sort of regularity; this tool lets you make the swaps without the hassle of removing most QR’s. It might seem a small deal, but I do this more now, along with front ring swaps as I use 1x… I like it better than typical combo of the smaller bolt head tool and adjustable wrench. Nuun seem like a great fit for the Sea Otter crown as their products and the company's ideology go hand in hand with the lifestyle and attitude of the people that show up every year to both race and relax on the Northern California coast. They’re a regular stop for me, as walking in that sun for 8-10 hours a day for 3-4 days means I need hydration, but as I’m not racing, I’m also particular about what I don’t need. 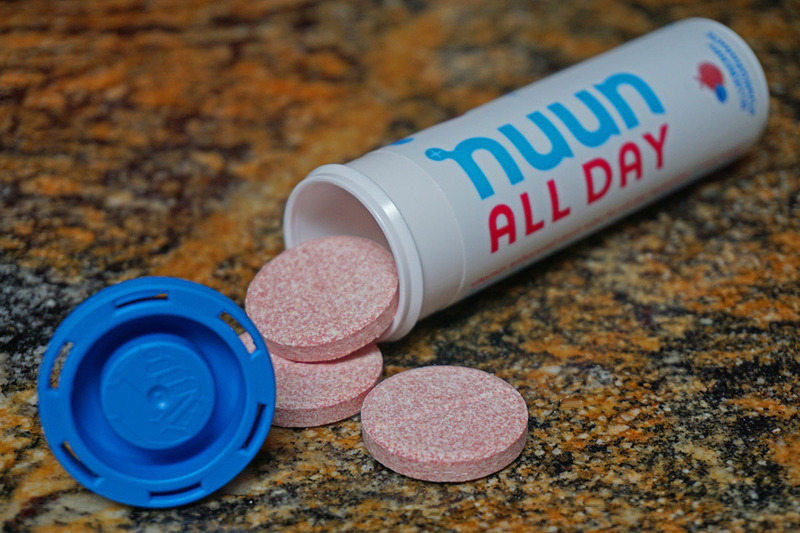 Nuun concentrate on “clean” and that applies to the product, the sport and the planet. 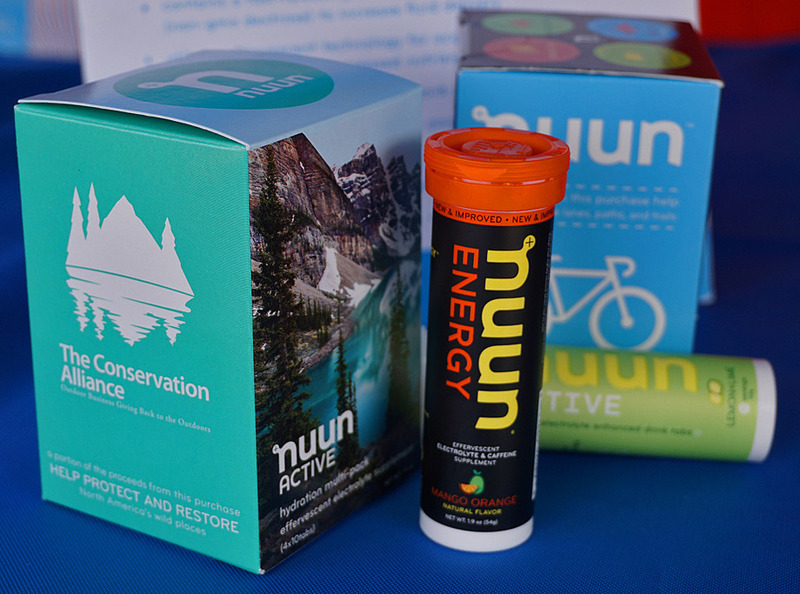 Nuun have partnered with The Conservation Alliance in a “hydrate for a cause” product collaboration where a portion of the proceeds of a new 4-pack of active hydration products will go directly to The Conservation Alliance with the continued mission to fund organizations working to preserve wilderness areas. 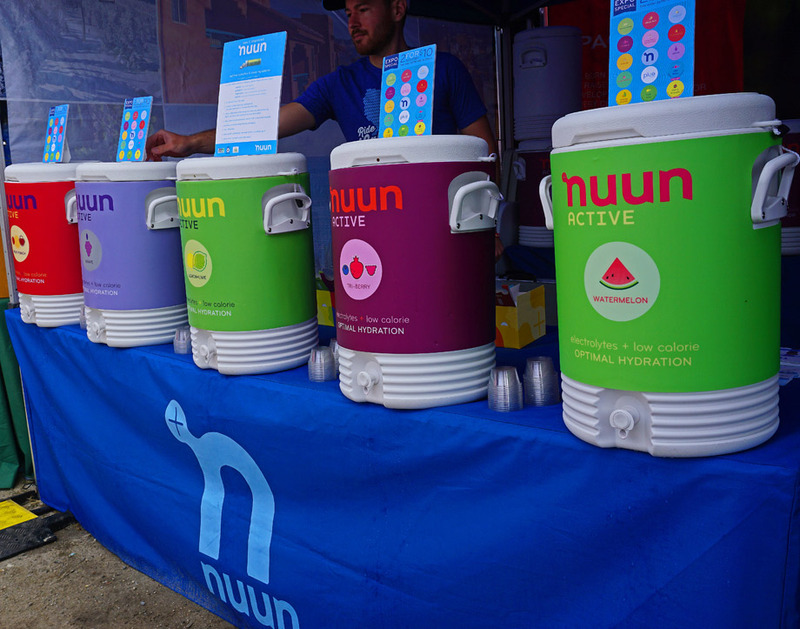 The Alliance now has 190 member companies that have contributed $165 million to the cause and Nuun are stepping up to promote the Alliance as well as donate. These 4 packs will be on the shelves at Specialty Outdoor retailers like REI and will have 40 servings of assorted flavors for $24. Nuun have also become Clean Sport certified, where the folks at Informed-Choice.Org go out and randomly purchase retail product and then independently test it for WADA banned substances. This isn’t cheap, but it’s one of the most effective and trusted testing programs that a company can participate in to ensure the viability of their products for their athletes and customers. With all of that said, I just like the stuff because it’s light tasting and effective. It does the job well and especially when you’re constantly active to the point where you have to consume so much to keep hydrated and fueled, Nuun’s going the extra mile to be clean on so many levels is both a performance and emotional bonus. 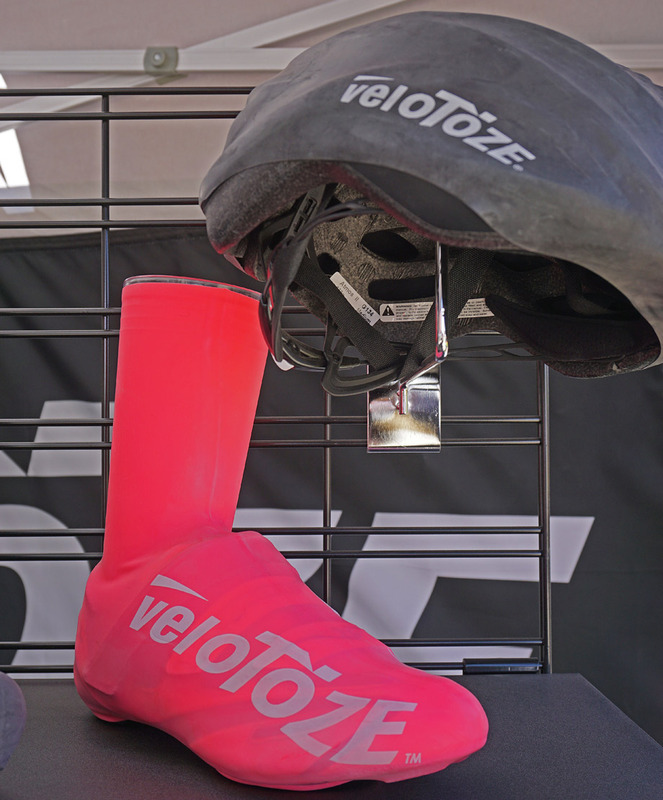 veloToze are a new company with a couple of products that are so head-slapping simple that you’ll wonder why someone else hasn’t executed it this well. 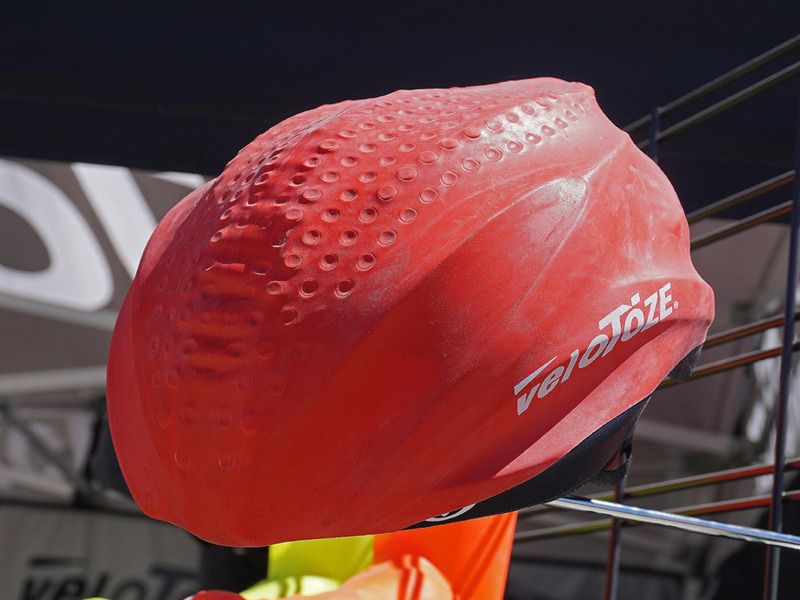 Highly flexible and snugly conforming, these are simple shoe and helmet covers that fit (and feel) like heavy duty surgical gloves for your head and feet. The shoe covers come in Tall / Short / Toe Size. Simple openings for your cleats (reinforced) and heel protection are set to go. I didn’t ask if they would make a more open bottom to accommodate mountain or Cross shoes but it would be a pretty easy task for them to handle. These are made from Latex like material that sheds water very well and is wind proof. Of course there are holes for cleats and tread on the full booties and water can get under a helmet so you can’t call this water-proof, but water’s not getting through the material itself during regular use. These are inexpensive at $13 for the toe covers $16 for the short and $18 for the tall. The helmet cover will run $22. I’m not sure about the long term durability of these, so I can’t speculate on the value, but the function seems fantastic. 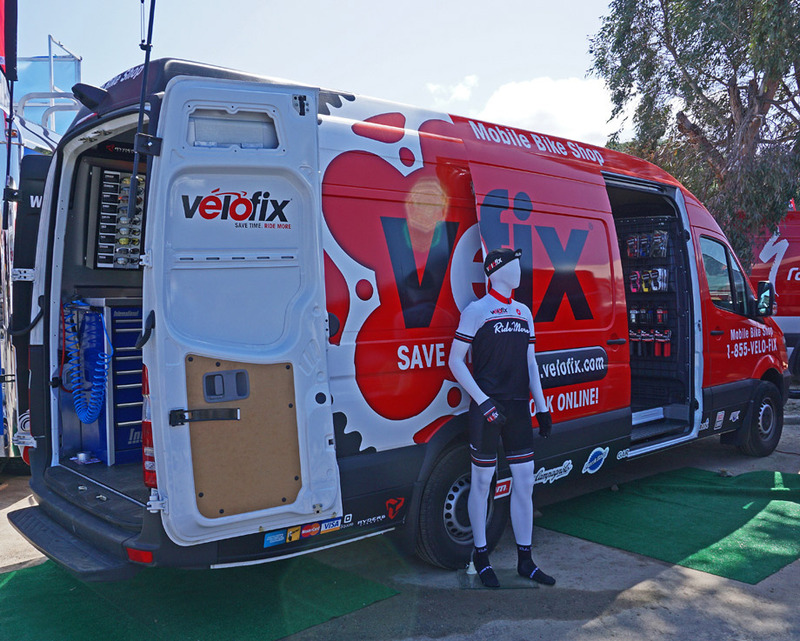 Velofix are newish franchisers that bring the bike shop to the customer’s front door. 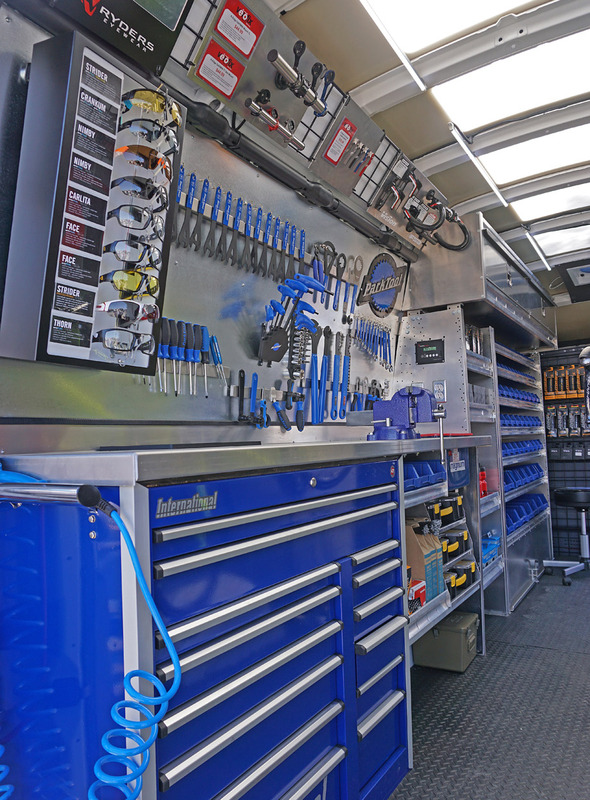 This is a turnkey business on wheels that comes with 24-7 booking services, call center support, an inventory management system (with multiple product lines) and a lot of business training beyond simply understanding how to drive and fix bikes. As the consumer-direct sales model starts to gain traction with a lot of manufacturers, this is a slick system that facilitates the service and support that customers want and in a fashion that requires nothing more than picking up a mobile phone to tablet.